Point Pleasant Resort - TM. One bedroom beautiful ocean view villa with extraordinary views and just steps away from the waterfront pool. Point Pleasant Resort - TM. This unique hilltop villa offers a large wrap around balcony, spacious living area, and amazing views and Caribbean breezes. Point Pleasant Resort - TM. Beautifully renovated one bedroom ocean view villa with a large corner balcony! 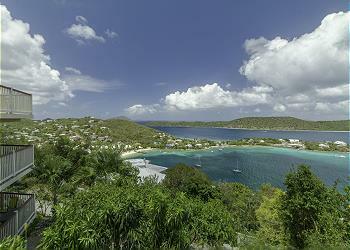 Breathtaking views of St. John and Jost Van Dyke while dining or just relaxing throughout the villa. Point Pleasant Resort - TM. Newly furnished hilltop villa with renovated kitchen and bathroom and amazing water and island views from wrap around balcony.